Nikki has found her forever home and is cruising the lake with her new family. Nikki is looking for her forever home. Great with people, other dog's and even cats. Nikki is 2 1/2 years of age up-to-date on her shots and spayed. 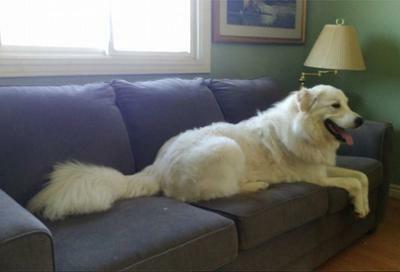 Nikki is a Great Pyrenees who is house-trained well-mannered and enjoys car rides. Nikki is available for adoption via Bow Wow Acres. We have very good information on our website which we encourage you to take the time to read. Please do your research on this breed to ensure this is the dog for you. 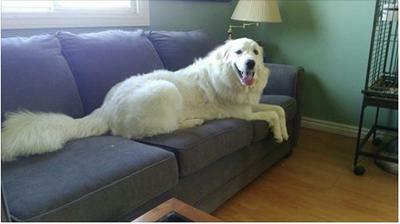 The Pyr is not for most people. As a Pyr, she does bark. This is one of the tools that allows them to do their job to warn off predators. They dig holes in your garden to stay cool in the summer, and shed at least twice a year and will leave white dust bunnies throughout the year. They will wander since this is instinctive to them as they are used to wander with the livestock for which they care. Please contact Bow Wow Acres at info@bowwowacres.ca for more information on Nikki. Interested in her where is she.